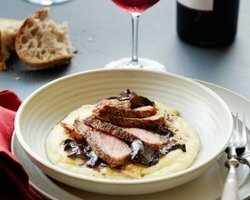 This classic dish highlights the earthy flavors of Portobello mushrooms, the richness of mascarpone polenta and the elegance of seared, rib eye steak. Pair with your favorite Temecula Valley Merlot or Syrah. Pour the water and the chicken stock into a medium saucepan over medium-high heat. When the water begins to simmer, whisk in the polenta and the 1 teaspoon (5ml) salt. Stir for 5 minutes while the polenta is simmering. Cover the polenta and turn the heat to low. Cook for 40 minutes total stirring every 10 minutes making sure to scrape the bottom and corners of the pan. Remove from the heat and stir in the mascarpone cheese. Cover and set aside. Preheat the oven to 450° F (230° C). Sprinkle both sides of the steaks generously with salt and pepper. In a large, heavy-bottomed skillet heat 2 tablespoons (30ml) of the olive oil over medium-high heat until very hot, but not smoking. Add the steaks and sear for 2 minutes on each side. Roast the steaks in the oven for 6 minutes. Remove the pan from the oven. Remove the steaks from the pan and let the steaks rest while you make the mushroom sauce. Thinly slice the mushroom caps into half moons then slice again crosswise into 1-inch (2.5cm) pieces. Heat the remaining 2 tablespoons (30ml) of olive oil in the skillet used for the steaks. When the oil is hot, add the mushrooms and cook and stir until golden brown. Add the wine and reduce the liquid by half. Add the cream and balsamic vinegar and the ½ teaspoon of salt. Cook and stir until the sauce thickens. Remove from heat and cover. To serve, spoon desired amount of polenta in the center of each plate. Top polenta with sauce and strips of steak. Avensole Winery 2014 Merlot ~ This wine is unique with blackberry and black cherry fruit with subtle hints of black licorice and vanilla, framed by silky tannins and a generous finish. Carter Estate Winery & Resort 2012 Merlot ~ This Merlot has a very long finish that is silky and firm with a shapely, tart tannic backbone. Fazeli Cellars 2014 Shiraz ~ Silky black currant and blackberry layered with hints of vanilla, earth and black pepper. Full-bodied with a rich, lingering finish. Monte De Oro Winery 2014 Syrah ~ Accents of cocoa bean, clove, anise, red and black peppercorns with a long gripping finish.